I've been in a phase of complementing my period instrument recordings with HIP recordings on modern instruments (I long for the sweetness and resonance of the modern string sound periodically). This recording is defintely one I will keep on my shelf. Performance-wise, I still think Leppard's 70's ECO recordings set a standard yet unmatched on modern instruments, but these come closest, and the sound is very fine indeed (the engineers at Delos should get equal billing with the musicians). One complaint: I don't find that there's any impulse, dance, drive to John Gibbons' harpsichord playing in the 5th concerto. By way of back-handed compliment to this very fine group of players, they respond excellently in kind to Mr. Gibbons lead, and as a result, the concerto is on the whole, somewhat staid. If you were this as a one and only set (being immensely fond of the 5th concerto) - compare for example, with Leppard's performance, or Pearlman's playing with the Boston Baroque Orchestra (one of, if not the finest, period instrument recordings). Thrills abound in the I Barrochisti recordings with Fasoli on harpsichord (another period instrument recording - Fasoli may be William Malloch in disguise). (P.S. By all means, just avoid the recordings of Musica Antiqua Koln, Marriner and/or ASMF - in a nothing to see here folks, keep on walking kind of way). I heard a bit of the 6th on public radio in the car where I was pleased they identified the players. Although I have them by the Boston Baroque (Pearlman) on period instruments, this set is wonderfully vibrant and extremely well recorded. 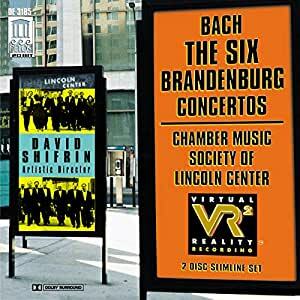 Best fecording of the brandenburg concertos!!!! Don't always agree with the balance. Too much flute at times. 5つ星のうち5.0Great recordings that replace lost set. Wonderful set of the concertos. Uses modern instruments. Great to compare with period instruments. Happy I found this set. Terrific Amazon service!!! !